The next time you go to a tech conference or startup event, stop and take 20 seconds to survey your surroundings. Then, mentally jot down the makeup of attendees: How many of them are men? How many of them are women? How racially diverse are participants? What seems to be the average age? Try this exercise a couple of times and you’ll undeniably see some trends emerge. I did this for the past month while covering various tech events across Europe (in Berlin, Monaco and Kraków) and noticed – unsurprisingly – the stark gender imbalance, lack of cultural diversity and most participants falling in the age range of mid-20s to 30s. There’s a reason why the tech and venture capital industries are often dubbed a “boy’s club”. Last month, Google published stats on the breakdown of its staff by gender and race – and it confirmed the commonly-held view of the tech community’s lack of diversity. About 70% of Google’s workforce are men and 30% are women. When it comes to race, the report said 61% of staff were white, 30% were Asian, 3% were Hispanic and 2% were black. The search giant may be one of the few to reveal concrete data on the gender and race of employees, but there’s no doubt that tech companies of all sizes face similar problems. For instance, a post by a Pinterest engineer last October revealed that 11 out of 89 engineers working for the online visual discovery startup were women. Even if there are hoards of articles online covering these issues in tech, consciously taking note of your environment first-hand, as opposed to only reading about these circumstances, has the power to leave a different, deeper awareness. The underrepresentation of women in tech isn’t something that can be easily ‘fixed’ and it’s becoming increasingly clear that the issue stems from deeply ingrained societal structures. However, in the last couple of years, several initiatives have spawned across Europe attempting to tackle the gender imbalance in the tech field. Geekettes, an organization focused on supporting female tech innovators, is one of them. Earlier this month, Geekettes hosted its first European Demo Day – which consisted of talks, discussions and a startup pitch competition – in cooperation with 500 Startups. “We have a really unique and rare opportunity to have an all-female VC panel – I think I’ve never seen this in my entire career working in technology,” said Geekettes founder Jess Erickson (pictured on far right), who has worked with startups and companies such as 6Wunderkinder, General Assembly, Deutsche Telekom, XYO and Factory. 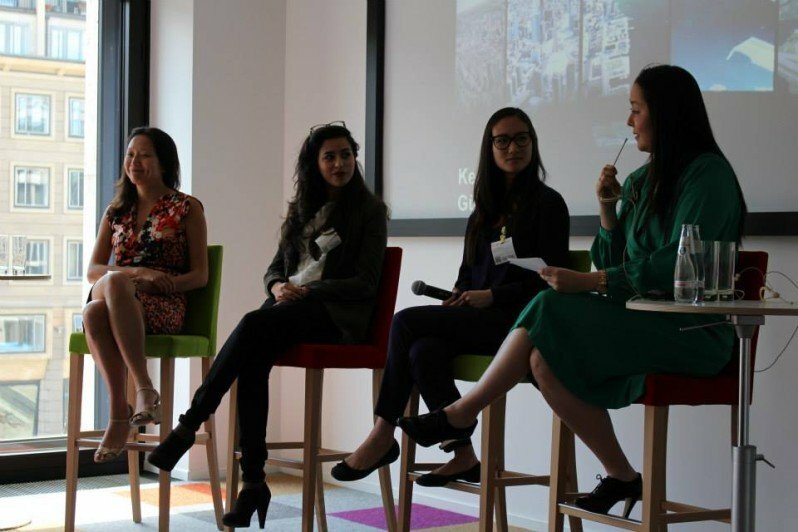 The panelists (pictured from left to right) included 500 Startups Venture Partner Bedy Yang visiting from San Francisco, Index Ventures Associate Sofia Hmich (based in London) and Hasso Plattner Ventures Analyst Lina Chong (based in Berlin). Speaking candidly about their experiences in tech and offering interesting perspectives on the world of venture capital, the colourful conversation was undoubtedly one of the highlights of the event. Opening the discussion, Erickson asked whether the gender “diversity ticket” was often brought up among both male and female colleagues in assessing companies. As for 500 Startups, most people who are familiar with the notable seed fund and startup accelerator program are also likely aware of founder Dave McClure’s outspokenness on the topic. Yang spoke enthusiastically about the last batch of companies in 500 Startup’s accelerator program in San Francisco, where 40% of participants were women. She also went on to discuss 500 Startup’s Women Syndicate, rolled out in February, which wants to invest $1 million into 10 companies in the 500 portfolio with women founders over the next 12 months. 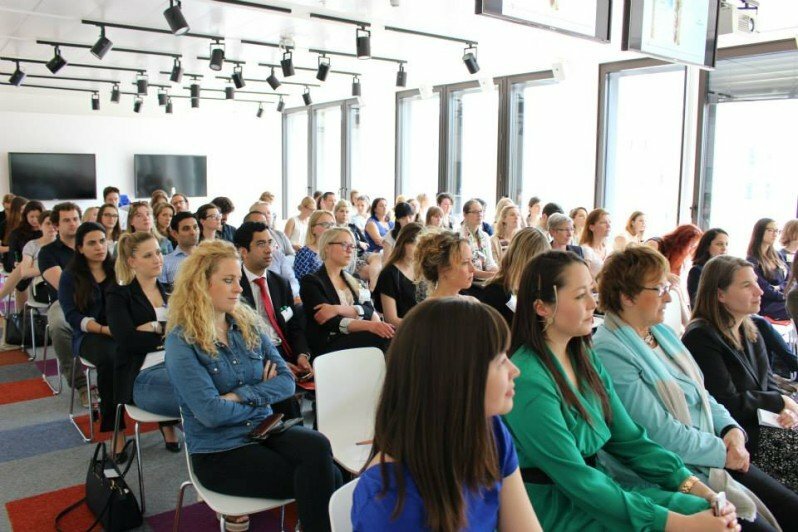 Pitching – is there a difference between male and female founders? Need funding for your startup? Being a(n attractive) male may help. A recent study from Harvard Business School – aimed at examining why the funding gap persists – found that investors of both genders chose to fund pitches presented by males 68.3% of the time while VCs chose businesses presented by females 31.7% of the time. Fiona Murray, one of the primary researchers of the Harvard Business report, said women-led businesses probably receive only 5% and 10% of all venture capital allocated to startups in their earliest growth phases. There are numerous theories about why this bias exists: perhaps women are not as inclined to ask for funding, or perhaps older men dominating the VC industry are more inclined to fund younger entrepreneurial men. I think the thing that’s different is that people think it’s different, because you create a pre-judgment on something and that’s when it’s wrong. It’s really interesting… So at 500, we’ve seen like 250 companies come into our accelerator and we see people pitching all the time. When we start training and a male comes in and he’s not very confident, people won’t say, ‘Oh, because you’re a male, you’re not confident.’ But if a woman comes in and she has a little voice, then people start saying, “Because you’re a woman, then A, B, and C”. Despite the discouraging data, these trends will hopefully change soon as more and more reports show the achievements of women-led tech ventures. According to studies by Google, women-led tech companies reached 35% higher return on investment and brought in 12% more revenue male-owned tech companies when venture-backed. There’s no doubt that women’s health, at the moment, is a hugely untapped market. Part of the reason can be attributed to the relatively small number of women VCs, which typically leads to a bias toward male-focused ventures. “Given that we still have a long way to go before we reach gender parity in terms of female-led startups and product offerings, I think that it would be difficult for any angel, male or female, to ‘specialize’ in womens’ products even if they tried,” said Ida Tin, CEO and co-founder of fertility tracking app Clue, in an interview with Fast Company earlier this month. “At the end of the day it’s about recognizing an opportunity when it’s in front of you. Maybe that opportunity is a little more obvious to female investors if it’s a product that they can relate to on a personal level,” Tin said. Touching on this topic at the Geekettes event, Erickson asked panelists about their thoughts on having more female VCs and whether this might help investors better understand women-oriented products. “I just want to take a step back and really make a distinction about a good/bad idea and a good/bad company – the fact that a woman is the founder of the company is a totally separate discussion,” responded Chong. “I think having women investors look at products geared towards women – that definitely makes sense. We’re the consumers. In the end, it certainly affects, maybe not in a very obvious way, but in a very nuanced way – an understanding of the market, the desire for the market and things like that,” Chong said. All images courtesy of Geekettes.